The third annual Bottoms Up Festival will once again showcase the best local craft beer, wine, cider, food, live bands and family entertainment the Upper Hunter has to offer. Spend the afternoon with friends between 1:30pm and 10:30pm at Simpson Park in Muswellbrook. The tasting packs include 5 tasting tokens which can be used for any of the alcoholic beverages available for tasting. The Beer Pack gets you a stubby cooler and a souvenir beer glass. The Wine Pack includes a wine glass holder and a souvenir wine glass. 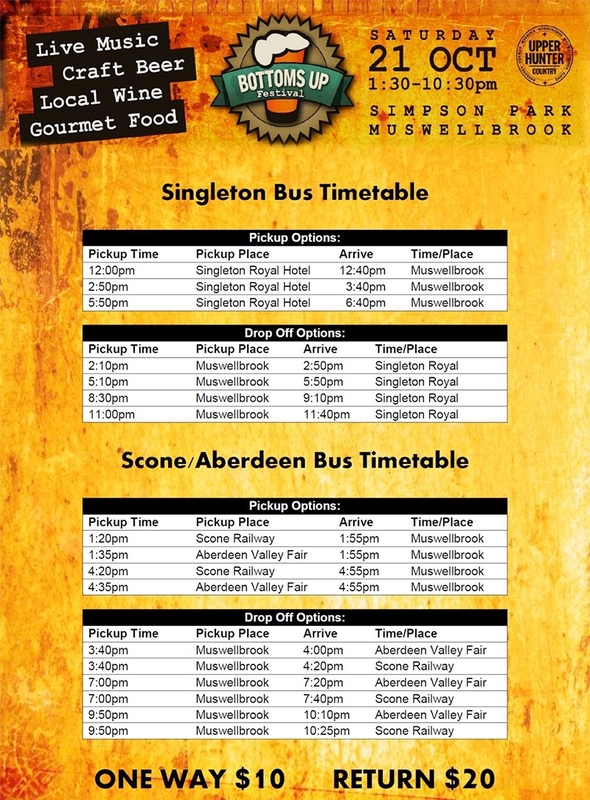 We have made this years Bottoms Up Festival easier to travel to with all your friends, with a few easy steps you can grab your festival tickets and select the bus from either Singleton, Scone or Aberdeen. Travel One way or Return. Add the optional Bus trip or Just press continue if you do not need the bus service. There will be plenty of street parking in the surrounding streets of the festival. If your preference is to catch a train to the Bottoms Up Festival we recommend you catch a train to Muswellbrook on Friday and stay overnight. There will be a bus service available from Singleton, Scone and Aberdeen. Tickets are limited and bookings are recommended. Please see the bus timetable below. Book an overnight stay in Muswellbrook to get the best experience. VISIT THE UPPER HUNTER COUNTRY WEBSITE FOR ACCOMMODATION OPTIONS IN MUSWELLBROOK. The right of admission is reserved and the Bottoms Up Music and Craft Beer Festival reserves the right to refuse entry to, or remove from the venue any persons causing a disturbance, partaking in an activity not allowed on the site, conducting any illegal activity or refusing to comply with reasonable requests from management. Management does not take any responsibility for anyone attending the Bottoms Up Music and Craft Beer Festival – enter at own risk policy applies. All persons under the age of 18 MUST vacate the Bottoms Up Music and Craft Beer Festival venue by 5:00pm. Re-Admission to the Bottoms Up Music and Craft Beer Festival will not be allowed after 7pm. Re-Admission to the Bottoms Up Music and Craft Beer Festival will not be allowed without a wristband and proof of ticket. Removed wrist bands will not be replaced. Last ticket admissions at 7pm after which the entrance and box office will be closed. Food and beverage products purchased outside the Bottoms Up Music and Craft Beer Festival are not permitted and cannot be brought into the venue. The Bottoms Up Music and Craft Beer Festival operates on a Challenge 25 policy – ID may be requested and must be presented on request. No refund for ticket holders unable to present ID. Acceptable forms of ID are a Driver’s License or photo identification. All visitors must comply with the responsible service of alcohol regulations and Bottoms Up Music and Craft Beer Festival reserves the right to remove any person from the venue that are refusing to comply with regulations. All beverages purchased at the Bottoms Up Music and Craft Beer Festival must be consumed inside the venue only and glasses will be required to be emptied upon exit. The Bottoms Up Music and Craft Beer Festival is supervised by a team of security professionals for your safety and enjoyment. The Bottoms Up Music and Craft Beer Festival operates a Zero Tolerance policy to the sale of alcohol to under 18 years, the consumption of alcohol by patrons under 18 years, the use of recreational drugs to include (but not intended to be exhaustive) cannabis, stimulants and Nitrous Oxide canisters. The Bottoms Up Music and Craft Beer Festival operates an Eviction policy for anyone believed to be ‘selling’ or ‘supplying’ any controlled substances and this may lead to possible arrest. Tickets are available online and at the entrance to the Bottoms Up Music and Craft Beer Festival. We reserve the right to have bags and other items be inspected by security staff. Persons who refuse bag searches WILL be denied entry or evicted from the the Bottoms Up Music and Craft Beer Festival without any refund. The Bottoms Up Music and Craft Beer Festival will not accept any responsibility for any lost or damage to personal property or items brought to the Bottoms Up Music and Craft Beer Festival. Ticket holders consent to inclusion in photographic, visual and audio promotion, broadcast or security purposes during the Bottoms Up Music and Craft Beer Festival. Smoking is only permitted in designated smoking areas within the Bottoms Up Music and Craft Beer Festival venue. The Bottoms Up Music and Craft Beer Festival is an outdoor event and will NOT be cancelled due to inclement weather. Bottoms Up Music and Craft Beer Festival management reserve the right to add, withdraw or substitute artists and to vary the programme or the event if necessary. The Bottoms Up Music and Craft Beer Festival reserves the right to alter or vary the content or timing of the whole or any part of the Bottoms Up Music and Craft Beer Festival due to circumstances beyond our reasonable control without being obliged to refund or exchange tickets.